A TIME TO BE SOWING! 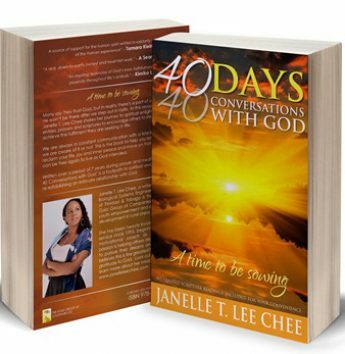 40 Days, 40 Conversations with God book by Janelle T. Lee Chee is a well assembled collection of memoirs, personal prayers, scriptures and faith building exercises to help and encourage others and all people on a spiritual journey. This is the book for the dreamer, the achiever, the warrior and the worrier which leaves you armed to go after your dreams and like a newborn baby begin life’s voyage afresh, only this time with a greater role in building God’s Kingdom. I tell you, you’ll grow closer to God through this uplifting Faith resource because the author is so real in her rendition and she speaks straight from her heart. Be ready to renew your commitment to God through this well written, honest and down-to-earth piece! Go to http://www.40daysbook.info and get your Bestselling faith book by gifted Janelle now!